I found artichokes priced three for a dollar the other day, and that, without further adornment, was the genesis of this week’s soup. As someone who claims to do improv in the kitchen, I take inspiration from ingredients I find at the grocery store. Yet because my efforts result in spectacular failures on occasion, price is a consideration. Gone are the days when I could experiment with someone else’s product. To be honest, there never were any days when someone else picked up the tab. I didn’t cook when I lived with my parents or in college and everything I did in cooking school cost me well over ten cents. So it’s always been on my dime. That’s why this fundraising dinner we participated in on Saturday was such fun. Not that we didn’t help pay for things, but because it was for several generous donors, cost wasn’t as much of an issue. I am also glad to report that after two weeks of practicing and much more planning, it turned out very well. And yes, I did contribute in a small way—a lot of prep, soup (twice), salad, a dessert and the palate cleanser. The menu was also fun because almost everything I did came from a recipe. The only thing I made up, the lemon fennel sorbet, never made it to the table. In part because it just didn’t fit but also because the stakes were too high to allow for a lot of improvising. Even some of the recipes had to be redone when the ingredients we chose were too overwhelming. I’m talking about the soup here, acorn squash soup, to be precise. I wound up having to make the recipe twice because I used apple-smoked bacon the first time and the whole thing turned into a bacon soup. It was so strong, the car I used to transport the soup smelled of pork fat for a week. But that was a minor fix. The great thing about following recipes is that you don’t have to reinvent the wheel every time. You might have to tweak an ingredient here and there, as some of you have no doubt done with my recipes, but the path is pretty clear. And, if the person who wrote the recipe knows what they’re doing (ahem), you wind up learning a lot too—flavor combinations, cooking techniques, presentation ideas, etc. Does that mean I’m going to start plagiarizing other people’s recipes? No, just that I’m going to look to others for inspiration more often. There are a lot of things I still have to learn. And let’s face it, conjuring soups out of thin air has often landed me in a culinary rut (not the same as a pot hole). Perhaps trying new things will keep that from happening as much. What I learned about this week was a little thing called a microplane. It’s great for zesting lemons. The same ones I wound up using in the aforementioned Artichoke Soup, which turned out pretty well. I did have a problem with the soup’s consistency at first (It was a little thin. ), but when I boiled it down to a more desirable thickness, the artichoke flavor became almost overwhelming. That’s why I threw in the optional goat cheese garnish. Place artichokes, lemon juice and zest in a large pot filled with the stock. (Note: I cut the artichokes in half to make them fit better.) Bring to a boil and reduce to a simmer for 45-60 minutes, then remove from heat. Retrieve artichokes from the pot and let cool. Pull the leaves off of the artichoke, discard the choke (the tough thistle bristles just above the heart), and return the hearts and stems to the pot. Puree the mixture and cook it down to about half the volume (let your taste buds be your guide here). Adjust the seasoning and cook through. (optional) Place a pat of goat cheese in the middle each bowl and ladle the soup over it for service. 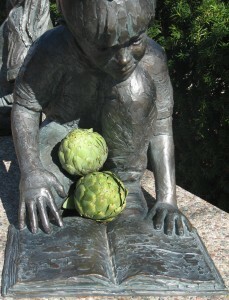 Image Credit: Artichokes & Readers Statue at the Wheaton Library. Photo by author. I wonder if there are any other edible thistles out there. If there are any you know of, I’d love to hear about them. I’ll be reading and responding.